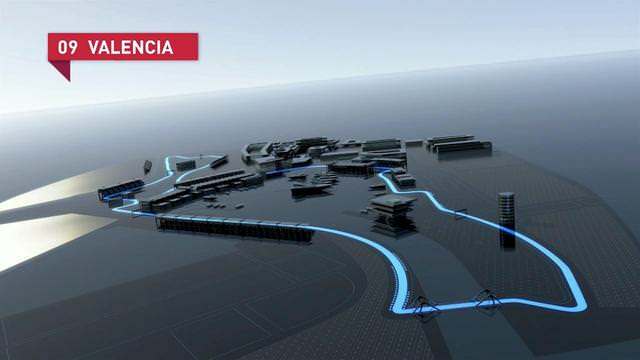 We've been dreading it for a while, but this weekend finally brings to us one of the worst tracks on this year's F1 calendar, the long and twisty Valencia Street Circuit. Endless concrete walls make it near impossible to pick one corner from the next, so the best hope you have of finding your way around the track is right here, right now. It is a street circuit, but not as you know it. The track is very wide, and it's all corners, corners, corners. The only noticeable landmark being the bridge F1 cars have to cross. As Mark Webber points out in the video, the bridge is part of a tricky bumpy section, and likely offers the only real challenge of the lap. Look out also for the unique pitlane entrance near the end of the lap, guaranteed to catch out an unwary driver or three during the weekend. It isn't big, it isn't clever. It is an endless expanse of concrete set in a none too spectacular dock yard. Webber does a fine job of making the 25 turns bearable, but audiophiles should listen out for the dodgy audio overdub near the beginning of the video.